Often, we hear that you should follow your passion. As long as you are doing what you love, and you put in the work, you will succeed financially. You’ll never feel like you are working, and you’ll have material success as well as the warm fuzzies that come with doing what you love. Often, “following your passion” is code for ditching the “rat race” and starting your own business. While entrepreneurship in an area that you love sounds good, the reality is that not everyone is cut out to be an entrepreneur. You need to make sure that you really are ready to put in the time and effort it takes to be a successful entrepreneur before you stop working to follow your passion. Just because you love something, and want to make money doing it, doesn’t mean that you have the business know-how, or the resources to stick it out until you are financially successful. Keep that in mind. Does Your Passion Involve a Marketable Skill or Product? There are a number of new opportunities out there for you to create your own lifestyle. And, even if you decide that you don’t care about being an entrepreneur, and you are fine with working for someone else, as long as you can follow your passion, you might run into trouble if your passion isn’t marketable. The truth is that loving something doesn’t make it marketable. I’m fortunate that I get to make a living doing something I enjoy. That something is writing. However, that doesn’t mean that every day I get to live my passion. If I could, I’d write about politics and religion all day every day. However, when I was really getting started as a freelancer, the topic of money was in demand. I like writing about money, and I love the personal finance community of writers, and I don’t regret what I do for one minute. But it’s not my true passion. Don’t ignore other opportunities because you aren’t passionate. You are better off doing something that you like “ok” and that is in demand than you are trying to follow your passion — at least if you want to make a living. Do You Want to Ruin Your Passion By Turning it into Work? I have a friend who makes a few hundred dollars a month off his hobby. He has a passion for it, and I once asked him why he doesn’t quit his day job and turn his hobby into a full-time business. What he told me stuck with me. He said that he doesn’t think his passion would remain so if he had to worry about it “succeeding” as a business. He doesn’t want his passion to turn into “work.” He also doesn’t want the stress involved with what it would take to become self-employed full-time. Right now, he can enjoy his passion in his spare time, and make some money on the side. If he tried to turn his passion into a full-time moneymaker, he’d feel forced into working on his hobby because then it would matter if it was making money. Right now, he doesn’t rely on the money from his passion to survive. The fact that it makes money is a nice bonus. He doesn’t want to change the dynamic. Your passion can be a good way to make money, but it might not be the best idea to focus on it. What do you think? 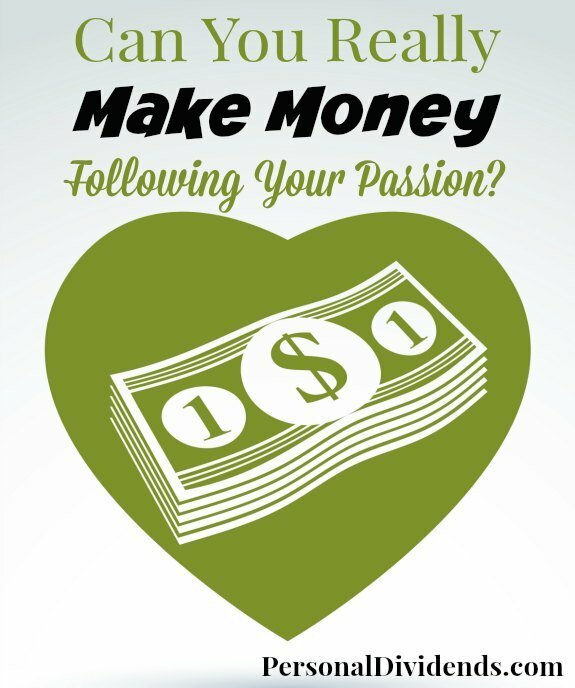 Do you think that just following your passion guarantees financial success? I also worry about my passions turning into work, or having to modify what I normally enjoy doing just to make some money. I chose to go into a career that’s somewhat interesting to me, but definitely not my passion.